It is natural when you are new to Royal Caribbean to want to learn all the tips, secrets and hints you can so that your Royal Caribbean cruise experience can be the best. These tried-and-true strategies are something many Royal Caribbean fans have come to learn after taking many cruises over the years. If you are new to Royal Caribbean, here are seven things Royal Caribbean insiders know about taking a cruise that you might want to consider doing too. This may not seem like that much of a secret, but the truth is guests that have cruised time and time again with Royal Caribbean embrace Royal Caribbean's customer loyalty program known as Crown and Anchor Society. Essentially, Crown and Anchor Society rewards guests for taking multiple Royal Caribbean cruises with special discounts onboard, priority embarkation and check-in, offers on upcoming cruises and exclusive events. There is no cost to join Crown and Anchor Society and the discounts you receive onboard alone are worth signing up for. Your Royal Caribbean cruise may not depart your port until sometime in the afternoon or evening, but Royal Caribbean veterans always show up early for two good reasons. First, the earlier you arrive means the earlier your vacation begins. Whether you arrive at the port at 11am or 2pm on embarkation day, the price you pay does not change, so you may as well show up earlier to get more time from your cruise. Second, by arriving early, you will avoid the longer lines at embarkation that typically occur on embarkation day when a majority of guests show up in the afternoon. Arriving in the morning allows you to get through security and check-in with less wait. If you are wondering what constitutes early, usually this infers any time before noon. Depending on your cruise, embarkation port and other factors, the check-in process can begin as early as 10am. These days, Royal Caribbean ships offer some amazing specialty dining options and if you want to ensure there is a table waiting for you, then you ought to book something before you set foot onboard. Royal Caribbean allows guests to make reservations for its specialty restaurants online, via the Cruise Planner site. By making reservations online, you will guarantee yourself not just a table, but the day and time that fits your schedule. This is especially important on formal nights or holidays, when many guests wish to do something special. Royal Caribbean recently announced their deployment schedule of when guests can see itineraries for 2017-2018 cruises and begin making reservations. Royal Caribbean veterans know the key to getting a good deal on a cruise and the perfect stateroom, is to book as far in advance as possible. Royal Caribbean veterans will tell you that the best way to get a good deal on a cruise is to book as early as you can. Ideally, years in advance. By booking early, you will often find the best rates available because cruise fares operate on a supply and demand basis. The less supply there is (i.e. staterooms available to book), the higher prices. So by booking one to two years early, you will find the best rates. If you ever strike up a conversation with a Royal Caribbean veteran, ask them when they booked their cruises, because the answer is often measured in years. These days, any Royal Caribbean commercial you see on television probably shows off the amazing things its newest, and biggest cruise ships offer and they are really, really stunning. But Royal Caribbean veterans know that it is just as fun and important to consider the smaller ships in the fleet. Royal Caribbean has a fleet of 23 ships of various shapes and sizes. While the largest ships gain the lion's share of attention, many veterans will tell you the virtues of the smaller ships in the fleet. Radiance, Vision, Sovereign and even Voyager class ships all offer some amazing experiences that cannot be matched on the larger ships. These smaller ships can get to ports of call that larger ships cannot, as well as offer a more intimate experience in relationship with your fellow guests. Not to mention, these smaller ships also come with a lower price tag! There is absolutely nothing wrong with sailing on an Oasis or Quantum class ship, but consider every class in the fleet for your next Royal Caribbean cruise, because Royal Caribbean super fans love them all. Let's face it: no one knows it all and that is why veteran cruisers often look for ways to congregate online and share in their experiences. The internet is perfect for sharing our collective Royal Caribbean knowledge, and there are some great resources you should consider when looking to learn more about Royal Caribbean. At the risk of sounding self-serving, this web site offers more than just blog posts as means of helping others have a better cruise. Read our message boards, listen to our podcast and chat with us on Periscope for some easy and fun ways to learn more about Royal Caribbean. In addition, Facebook has become a wealth of Royal Caribbean information, and here are a few of our favorite Facebook groups that you might consider joining. We would also be remiss if we did not mention the Cruise Critic message boards as another great online resource of Royal Caribbean information. Are you a Royal Caribbean veteran? 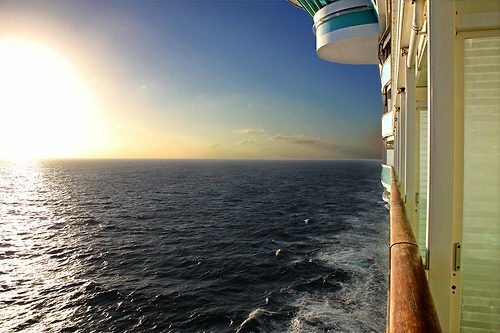 What advice would you give to someone new to Royal Caribbean? Share that tip in our comments! Royal Caribbean offers cruises on 25 cruise ships to destinations in the Caribbean, Europe, Alaska, Asia, Australia and everywhere in between. That is a lot of cruises! First time cruisers may find the choices a bit overwhelming with the various options. The good news is, the decision is not as complicated as it may seem. Here are a few guidelines that would make for a perfect first cruise. Royal Caribbean has built up a lot of cruise ships over the years and they each offer something different and interesting. For first time cruisers, the best choice is to lean towards the newer ships in the fleet because they will offer the latest innovations, entertainment and choices. Royal Caribbean's Oasis and Quantum class ships are perfect for first timers. In fact, it can be argued the Quantum class was designed with first time cruisers in mind. Ships such as Allure of the Seas and Anthem of the Seas pack a lot of entertainment, dining and tech onboard that offer the kind of "WOW moment" experiences many new to cruise guests have heard about. The other ships in the fleet are wonderful too, but we feel the Oasis and Quantum class ships are best suited for new cruisers. If you are trying to decide between itineraries like eastern or western Mediterranean or a Bahamas cruise or to visit Cozumel or St. Thomas, these are the typical quandaries those new to cruising all go through. For a fist time cruiser, we think it makes the most sense to pick an itinerary that mixes in an even amount of sea days with port days. The reason for this is so that you have ample opportunity to explore the ship as well as the places you visit. It may be tempting to pick a shorter cruise, but we recommend going with a five to seven night sailing because those three and four night cruises are really, really short. By going with a slightly longer cruise, you will have the opportunity to really explore the ship and enjoy the experience. Shorter cruises go by so quickly and for someone new to cruising, it may not provide enough time on ship or on shore to really get a sense of it all. Royal Caribbean ships are designed to be destinations rather than just a floating hotel room, so you will want more time to experience it all. We typically find cruises closer to a week in length provide a great balance of value, time and opportunity. An itinerary with a good mix of port calls and sea days will give first time cruisers a good sense of what a cruise is like, so try to avoid sailings with lots of sea days (such as repositioning cruises) or lots of port stops. 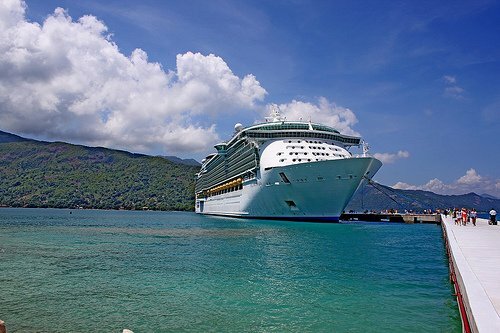 It is difficult to go wrong with an eastern or western Caribbean sailing that includes a stop at Royal Caribbean's private destinations of Labadee or CocoCay. These private stops are great for a beach day and many guests really enjoy their time there. In addition, cruises to the Caribbean offer fun islands to visit that are well-established with plenty to offer in terms of shore excursions. For cruises that go to Europe, Asia or Alaska, it is important to look for sailings that mix in that blend of port stops and sea days. Regardless of which ship you pick and which sailing you want to cruise on, everyone wants to make sure they are getting the lowest price. There are some good strategies for ensuring you get the lowest price possible. If there is one rule of cruise pricing that you should remember, it is that it is always best to book your Royal Caribbean cruise as far in advance as you can. There is no such thing as booking your cruise too early because as more guests book a sailing, inventory drops and prices start to creep up. Cruising has never been more popular and Royal Caribbean ships routinely sail completely full, so it is best to book well in advance. Ideally, you will book somewhere between 7-18 months prior to your sail date. If you can manage to book earlier, that is even better. A great strategy to keeping your cruise fare low is to choose times of the year to sail when many others are not. Royal Caribbean offers cruises year-round and like every industry, there are high seasons and low seasons. If you can take a cruise during times of the year that do not coincide with school or government holidays, you will find lower prices overall. Everyone is looking for a deal when they book a Royal Caribbean cruise and there are definitely some good ways to save money. Getting a deal on a cruise has a lot to do when you book your cruise and what time of year you are looking to cruise. Here are a few good ways to save money on your next Royal Caribbean cruise booking. Keep in mind that when you book a Royal Caribbean cruise, the time of year you are looking to cruise has a great influence on the price. In general, the more people that are also looking to vacation, the higher the prices. For example, a cruise over a time when there is a school vacation will likely see higher prices than similar sailings in the weeks before or after. For a good starting point, consider when schools are on vacation as times to avoid, since that is when a lot of families look to travel. Just like the time of year, where you want to cruise can factor into the prices. Summer in the Mediterranean, summer in Alaska, winter in the Caribbean are all good examples of high season demand, and that leads to higher prices. By looking at different months, you can swing a much better rate. Look for what's known as "shoulder months", which are the times of year at the beginning or end of the prime season, when demand is less and prices are lower. A good travel agent can really help you nail down some great rates because they are "in the loop" for all the promotions available today, as well as any new promotions that can be applied to your reservation. Keep in mind that the price of a Royal Caribbean cruise is the same everywhere. The difference is a travel agent can help you figure out which discounts and booking incentives will benefit you the most, and assist with ensuring that any new promotions that come out will be applied to your booking. These days, Royal Caribbean cruises have never been more popular, so the key to getting the best rates is to book as early as you can. Ideally, booking your cruise 9, 12, 18 or 24 months in advance is the best way to lock in low prices. Cruise fares are a lot like airfare, where the more folks that book, the less capacity there is and therefore, prices rise. The days of last minute discounts are being eliminated, so you definitely want to book as early as you can to ensure you have the lowest rates. What are your best tips on the cheapest time to book a cruise? Share them in the comments! We get a lot of questions on the blog, and a common question is about what to do if the dining choice for dinner that a guest wants is not available. Sometimes a guest will book a Royal Caribbean cruise, but discover that a particular traditional dinner seating is not available. Or perhaps My Time Dining is booked up. Is there any chance to change it? The answer is, there are two strategies to use when trying to get into the dining option you really wanted. When a particular dining option gets filled up, Royal Caribbean will allow guests to be added to a waitlist. These waitlists are virtual queues, where if another guest leaves that dining option for some reason (usually due to cancelling or transferring their cruise reservation), the next guest "in line" can take their spot. To be added to a waitlist, you need to contact either Royal Caribbean directly or have your travel agent do it on your behalf. Once you are added to the waitlist, you should see a notation on your reservation in the My Cruises section of Royal Caribbean's web site. In many cases, the waitlist will eventually come through and you will be automatically added to the dining option of your choice You will likely not be notified of the change, so you will have to log in periodically to your cruise reservation to see if something has changed. Sometimes, the waitlist option does not work and your next best option is to go speak to the head waiter on embarkation day. 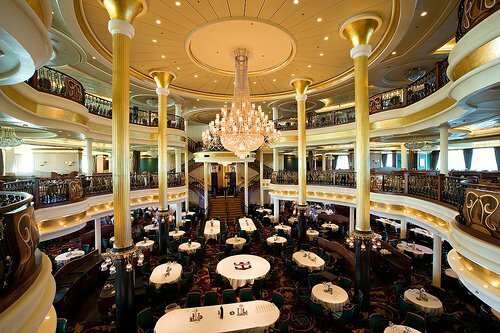 Once you board your Royal Caribbean cruise, go to the main dining room in the afternoon to speak to the head waiter. There should be a head waiter on duty in the main dining room for a few hours in the afternoon. Politely explain your request to the head waiter and ask if there is a way to be moved to the dining option you prefer. In our experience, this fallback usually gets the job done. Royal Caribbean wants their guests happy and the head waiters have a good sense of the guest dinner distribution. Check out these other helpful posts about dining on a Royal Caribbean cruise! Hopefully one of these two choices will get you the dining preference you really want! When the days until your next Royal Caribbean cruise start to tick down to the point where you start to see the light at the end of the tunnel, that means it is time to pay off your Royal Caribbean cruise in full. Royal Caribbean requires guests pay the full fare by a certain point in advance of embarkation day. Guests only have to put a deposit down well in advance to reserve a stateroom and price but a good two months before your Royal Caribbean cruise, you will have to make a final payment. If you fail to make final payment on time, you risk jeopardizing your stateroom you reserved and the rate you had locked in. 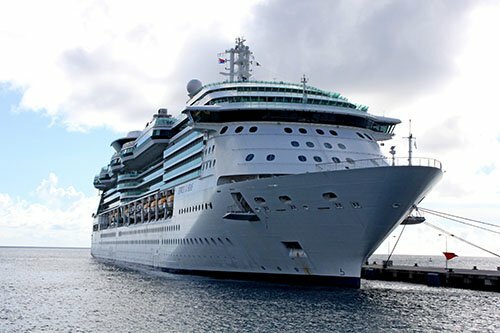 If you booked your Royal Caribbean cruise directly with Royal Caribbean, you can either call Royal Caribbean directly and give payment over the phone or you can log onto the Royal Caribbean web site and provide payment there. If you booked through a travel agent, you can simply contact your travel agent and provide payment to them. Some travel agents will require final payment a few days before final payment date because the agents want to make sure there are no slip ups. Let’s face it, no one likes having to lay out thousands of dollars at once because, well, most folks prefer to make smaller payments than a large lump sum. Larger lump payments mean it is more of a hit on your family’s personal finances. One option you have is to spread out payments between when you make a deposit and the cruise itself. Royal Caribbean will allow guests to make payments of any amount in the interim period before final payment. This will require some pro-active work on your part but it will mean less of a “big hit” once you have to pay the cruise. Guests may make payments of $500 or more online or call Royal Caribbean directly to make payments of less than $500. Another option if you would prefer to keep your money with you but avoid that “big hit”, is to stash the money in a “piggy bank” of sorts. Many banks allow automatic transfers between accounts, so conceivably one could have a little bit of money stashed away at specific periods so when final payment date shows up, you are prepared. Taking your first Royal Caribbean cruise is such an exciting opportunity and naturally, there are plenty of questions and concerns first timer cruisers may have. One of the best resources for planning a Royal Caribbean cruise is a knowledgeable travel agent, who can guide you through the process and not just get you a low rate for your cruise, but also offer advice and assistance in making the planning part of your cruise super simple. We asked a few travel agents what their advice would be for someone that is going to taking their first Royal Caribbean cruise. Jason Poole of Cruise Planners: "Book early. The days of last minute deals are quickly coming to an end. Don't assume the price on the website is the price you will pay. Travel agents have access to special rates for their clients." Stephanie Miller of MEI Travel: "Each sailing can be different due to the ship, itinerary, activities, ports visited and time of year. Be sure to ask an agent or educate yourself as to which sailing is best for you! Once you have the right expectations you can sit back and just enjoy." Missy Geary Bonnice of Storybook Destinations: "Best tip-use an agent. Not only do they have knowledge of each ship (and with Royal Caribbean, there is a lot to know! ), but they can also make sure you're getting the best deal possible, and it won't cost you anything! But if we are talking an onboard tip, I would say not to plan too strict of an itinerary. There is so much going on each day, just go with the flow and enjoy!" Christy Pudyk of Vacations by Christy: "Read the Cruise Compass each night- it will be delivered in your cabin each night. Most things in it do not have an additional charge- it will be indicated if there is a charge. And you can't possibly do everything offered. Take the pictures with the photographers. They don't charge for them unless you want them! Take advantage and get family shots." 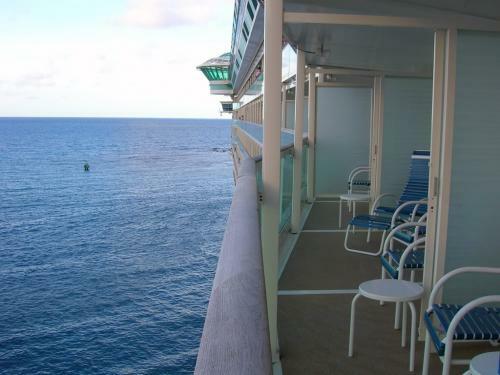 What tips would you offer to a first time Royal Caribbean cruiser? Share them in the comments! We love to broadcast live on Periscope (a free social media app that allows live video streaming) and on one recent broadcast, we received a question about what is the best advice for someone going on their first 7-night cruise. It got us thinking, because there is so much that goes into a Royal Caribbean cruise that we wanted to pick out the really important tips to share for someone about to take their first 7-night cruise. Each evening, your stateroom attendant will deliver to your stateroom the Cruise Compass, which is a daily guide to the news, events and activities that will be occuring on your ship the next day. The Cruise Compass is more than just knowing what time bingo is at. It offers you insight into tomorrow's weather, which bars will have drink specials, shore excursion information and more. A typical Royal Caribbean 7-night cruise will feature two formal nights, so be sure to pack accordingly. Usually, the first formal night will be on the second night, whereas the second formal night can vary between the fifth or sixth nights of your cruise. What is formal night? Formal night is an evening where the dress code at the main dining room is more upscale. For men, this means collared shirts with nice pants (tie and jacket optional) and for ladies, it is a nice cocktail dress, dress or something else similar. 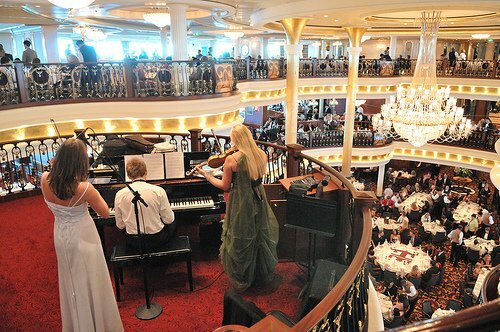 Keep in mind that formal night dress attire only applies to the main dining room and no where else on the ship. If you prefer not to dress up for formal night, there are other dining options onboard that you can go to. Your seven night Royal Caribbean cruise will be over before you know it, so be sure to explore the ship properly early so you do not miss out on any of it. These ships are really big and that means there is a lot to see and do onboard. Do yourself a favor and explore the ship as much as you can in the first day or two of the cruise so you can easily navigate the ship as well as learn about what is offered onboard. Embarkation day is always the best time for exploring your ship, so take advantage of your first day onboard by arriving to the ship early (before noon) and just walk around. You will discover bars, restaurants, public spaces, cinemas and more that you will likely want to stop by later on in the cruise. Most Royal Caribbean ships now offer interactive wayfinders, that allow you to navigate your way around the ship quite easily. Take advantage of them on each deck to more easily acclimate yourself to the ship. Bonus tip: Speaking of early, be sure to arrive to your ship early on embarkation day. Between 10am and 11am is a great time to beat the crowds and start your vacation sooner! Something Royal Caribbean really excels at is entertainment and on a 7-night cruise, there are lots of great shows to take in. Ice skating shows, Broadway shows, featured productions, comedians and more are available to see and they are all included in your cruise fare. Do yourself a favor and see the shows, even if you just go for a little bit to get a taste of what to expect. They really are great spectacles and each show offers a little something different. Onboard a Royal Caribbean cruise, you will find singing and dancing, comedians, magicians, acrobats and more. Royal Caribbean really does a great job with putting these shows together and the production values and acting are top notch in all of the shows. If you have children, be sure to stop by Adventure Ocean and sign them up for the complimentary kids program Royal Caribbean offers. The Adventure Ocean program is designed to let kids explore, play and have fun and it really is a fun way to spend a week at sea. Kids will love it because it's a chance to meet and play with other kids their age and parents will enjoy the time to themselves. If you wait until day two or later, everyone else will already be situated and your child may feel like a wallflower, especially if they are shy. Adventure Ocean is included in your cruise fare, so stop by the Adventure Ocean room on embarkation day to check the facility out as well as get any questions answered. Royal Caribbean's unlimited alcohol and beverage packages have never been more popular and they can be a great way to lock in a single price for the duration of your cruise. The key thing to remember about a 7-night cruise is that you want to make sure you will be able to leverage these drink packages on all 7-nights, otherwise the package may not make financial sense. On 4-night cruises, the drink package value can be easily gotten but 7-nights is a longer time onboard and "drink fatigue" can set in. Between having limited time to drink onboard during port days and the daily need to drink to "get your money's worth", we have talked to plenty of guests who would have been better off financially after a 7-night cruise by buying their drinks a la carte. There is no simple answer for everyone, but our advice is to consider that you will be on your ship for 7-nights and whether you want to be drinking 5-6 drinks per day, every day. There is much more you can learn about a 7-night Royal Caribbean cruise and here are some additional resources to help you. Should you buy the unlimited alcohol packages? All this week, we are helping first time Royal Caribbean cruisers with all aspects of the cruise vacation. Check back every day for a new post aimed at those who are new to Royal Caribbean! So you are ready to book your first Royal Caribbean cruise but the savvy consumer side of you knows there must be a sale or promotion that you can take advantage of to reduce the cost of your cruise. And you would be right! Here's what you need to know about finding a deal on your Royal Caribbean cruise so your first cruise can be an affordable one too! To remain competitive in the cruise market, Royal Caribbean will usually have promotions and deals out there at any given time to entice guests to book a cruise. While Royal Caribbean does change its sales tactics up now and then, there are some general promotions that are available somewhat regularly that you should be aware of and what they mean. Royal Caribbean's go-to promotion these days is the BOGO sale. Essentially, you pay full price for the first guest in a stateroom and the second guest is 50% off. This promotion has been available regularly for the last 12-18 months as of the writing of this post. 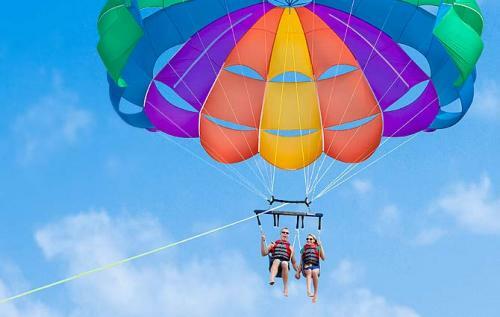 Royal Caribbean does tend to combine this promotion with other promotions to make each offering a little more exciting. In general, Royal Caribbean has a WOW Sale at an almost quarterly basis, and for first time cruisers, this may be your best promotion. WOW Sales offer 50% off deposits and free onboard credit. What makes WOW sales good for folks new to Royal Caribbean is you get onboard credit that usually is not available to first time cruisers. Royal Caribbean is in the process of phasing out last minute deals on cruises, but they do still pop up now and then. Last minute sales are for deals on cruises that sail somewhere between 30 and 60 days from booking, so you will need to act fast and be flexibile in the sailing, stateroom and transportation options to the port. These can be legimitately good deals but most people need more advanced notice and prefer different sailings. There are other promotions Royal Caribbean keeps up its sleeve that they use to enhance some of the other deals. These can include free gratutities, free shore excursions, a small amount of onboard credit and more. These promotions aren't deals on their own, but can be used in combination with other deals. When you are new to Royal Caribbean cruising, your best place to start is with a travel agent that knows Royal Caribbean well. It is a travel agent's job to keep track of the various promotions and provide guidance to you for your best deals. We always advocate using a travel agent for the services they provide you, which are free to you (Royal Caribbean pays them a commission, so there is cost to you). Ask your travel agent about what promotions are out there as well as regional and vocational discounts available. Travel agents may also have access to additional onboard credit or savings through agency-specific promotions. It never hurts to consult a few different agencies to find the right one for you. Royal Caribbean maintains a list of deals available on their site that are also a good frame of reference to see what they are offering. There may be a deal on Alaska cruises that you were not thinking about and find that to be a better deal for you. Unline a grocery store, most promotions are applied automatically on Royal Caribbean's site. So when you price out a cruise, it will use any deals that are out there, so you can track the cost of any sailing. There are lots of places online and in-person that will sell you a Royal Caribbean cruise but keep in mind that Royal Caribbean maintains strict pricing on its cruises. That means the price of a given sailing at any given time will be the same no matter if you call Royal Caribbean directly, use a travel agent or find some web site selling a cruise. The difference can be travel agent specific deals, where perhaps a travel agency has a block of rooms reserved that lowers the cost of the stateroom or the agency is offering onboard credit that comes out of their pocket. The other important concept to understand about cruise prices is they are a lot like airline prices. What you price out today may be completely different tomorrow, an hour from now and three months from now. Royal Caribbean allows guests to rebook their cruise as many times as they want up until your final payment date. Once you hit final payment and make your final payment, your price is locked in and you cannot change it without a penalty. There is one caveat to this rule and that is if the price of your cruise drops to the point an upgrade in your cabin is as inexpensive or more than your current cabin, Royal Caribbean will upgrade you to that category. Regardless of the promotion Royal Caribbean is running or where you live or anything else, there are some strategies to finding lower priced cruises. The months of August through October are the height of hurricane season in the Caribbean and most folks avoid cruises during this time because of fear of a storm impacting their cruise. Booking a cruise during these months can be cheaper than other months of the year because there is less demand for these sailings. If you are worried about what happens if a hurricane should strike, the good news is Royal Caribbean will reroute their ships around the storms. It is quite rare to have a sailing be cancelled due to a hurricane. If you only want to cruise during popular times, such as summer in Europe or winter in the Caribbean, then book as far in advance as you can. The earlier you can book your cruise, the better the price in most cases and by locking in the price early, you will be rewarded with the lower fares. In addition, you can always pre-book your sailing if the price drops up until your final payment date. Royal Caribbean and the cruise industry as a whole want guests to book early and not wait for the last minute so they will price their cruises lowest when sailings are first announced. How early is early? If you can book at least 8-12 months in advance, you are in the right time frame. If you can book even earlier, such as up to 24 months in advance, you may net even larger savings. Royal Caribbean will allow guests to place a 24 hold on a particular sailing, so your stateroom and price can be locked in. Use this strategy to give yourself time to research and think about a cruise without fear of losing out on availbility or price. When in doubt, it is best to use these courtesy holds to get more time to consider all of your options. Working with a travel agent and using courtesy holds can be a good way to keep your options open. Royal Caribbean has a large fleet of cruise ships and quite often new cruisers are attracted to the world's largest cruise ships, the Oasis class. Whether you are sailing on Oasis of the Seas or Allure of the Seas, here is what you need to know about these ships if you are new to cruising. 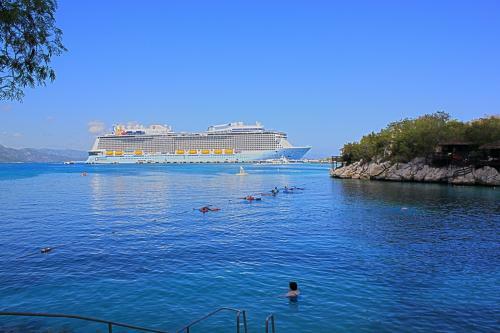 Yes, Oasis of the Seas and Allure of the Seas are the two largest cruise ships in the world (as of the writing of this blog post) but that does not mean these ships are impossible to navigate. Despite their size, Royal Caribbean designed these ships to be easy to get around. Each ship has 7 distinct neighborhoods that have their own look and feel. The neighborhood concept makes getting around easier because areas of the ship do not blend into each other. One of the best things you can do once onboard these ships is walk around and explore. There is a ton to see and do on the Oasis class ships and beyond just knowing where everything is, there is lots to discover. Art, activities, live music, decor and more are in all the neighborhoods. Embarkation day is a great time to just walk around the ship and explore because it is the one day of the cruise where there is not a ton of activities going on. You will discover a lot more but just finding these handful of areas onboard will be a good starting point. Also be sure to explore these areas at night too. Places like Central Park and the Boardwalk literally transform when the sun goes down and can be great spots to sit and enjoy the view. The entertainment on Oasis of the Seas and Allure of the Seas are really hard to beat and Royal Caribbean has put on them some of the best shows you will find across Royal Caribbean's fleet. Even if you aren't "a show person", Royal Caribbean puts on some impressive entertainment that caters to a lot of tastes. You will find Broadway shows, ice skating, water shows and a whole lot more! Speaking of Broadway, each ship has their own Broadway show. Oasis of the Seas is showing Cats and Allure of the Seas is showing Mamma Mia!. By far the Broadway shows and the shows in the Aqua Theater stand out as must-see entertainment on either ship. Select shows offer the ability to book reservations in advance via Royal Caribbean's web site. Don't worry, there is no cost to do this, but we recommend booking any entertainment you can in advance to avoid lines at show time. There are plenty of complimentary restaurants to eat at on your Royal Caribbean cruise but you should really consider dining at some of the specialty restaurants available onboard. Specialty restaurants are restaurants where there is an additional charge to dine there. Usually, there is just a cover charge that includes the cost of the meal and gratuity, although some restaurants are priced a la carte too. The reason you want to try some of these specialty restaurants out is because of the wide variety of really good food they offer. Sushi, Italian, American, Mexican and more are available at these restaurants on Oasis of the Seas and Allure of the Seas. Either browse their menus online or walk by the restaurants during your cruise and check out what they offer. Remember there are some good ways to save money off the cost of specialty restaurants, so there is no excuse to pay full price! What would you recommend to someone going on Oasis of the Seas or Allure of the Seas? Share your tips in the comments! There is so much to see and do onboard your Royal Caribbean cruise, and for a lot of guests, dining is a big part of that activity. Even if you aren't a foodie you still will be eating quite a few meals onboard and that has some folks wondering which drinks are included and which drinks cost extra. 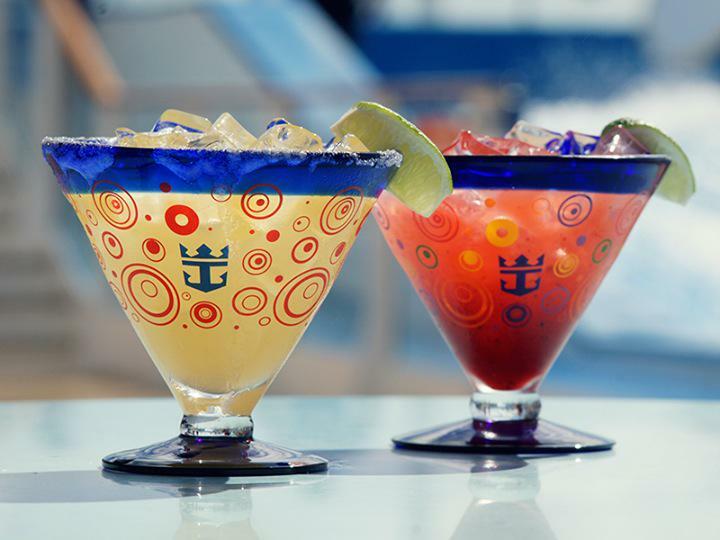 Here is a quick guide to what you need to know about the drinks on a Royal Caribbean ship. Alternatively, guests may purchase other beverages for an additional cost during the cruise. For all of these drinks, you may purchase each drink individually or purchase a beverage package that will give you either a set allotment of beverages or unlimited access onboard to them. During your cruise, there are opportunities to get drinks that would otherwise cost extra for free. If you keep an eye on your Cruise Compass, you should see many, if not all, of these opportunities on your next cruise. Diamond, Diamond Plus and Pinnacle members will get free alcoholic drinks before dinner. Since this post is aimed at first time cruisers, that is probably not you, but it is something to keep in mind for the future. 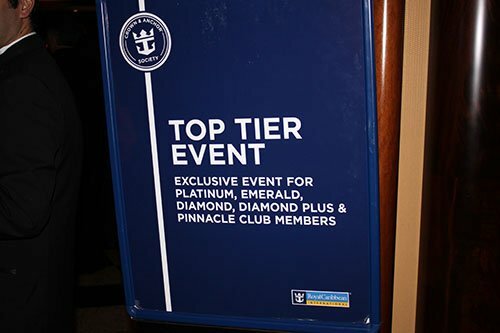 If you are at least a Gold member or above in Royal Caribbean's Crown & Anchor Society, there are welcome back parties held, where wine and cocktails are served for free. There will be regularly held art auctions onboard your cruise and as a means of enticing guests to attend, there is complimentary champagne available. Guests that are staying in a suite will have access to free drinks in the Concierge Lounge. 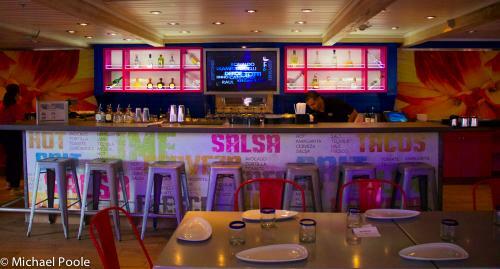 Read more about First time cruisers: What drinks are included with your Royal Caribbean cruise?